This is a beautiful large, musical jewellery box, made in Sorrento, Italy. It dates to the 1920s and has its original working lock and key. The entire box is in complete original condition, apart from a lovely feature which has been added to the inside of the lid. Details of this are in the paragraphs under 'The Interior' heading below. The exterior has a variety of decorative veneers, including Burl Maple, Mahogany and Walnut. 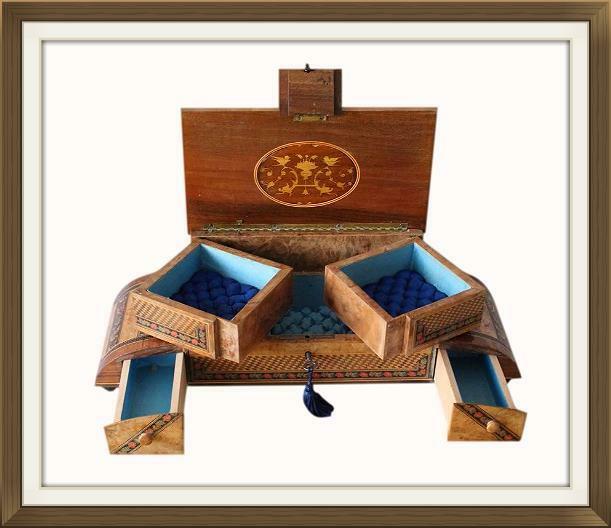 It also has an extensive amount of inlay, made up of several other varities of wood. 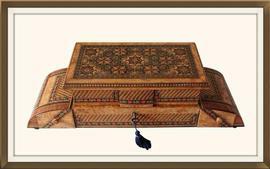 A description of this beautiful inlay is given below. 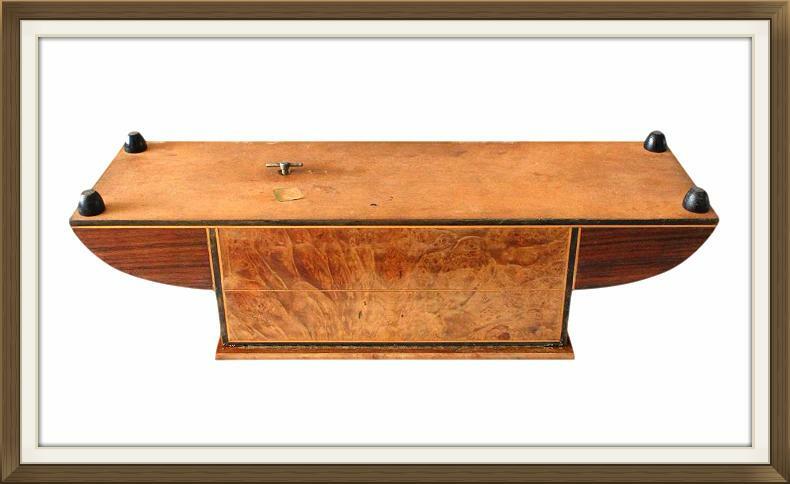 The lid is complete with its original long piano 'stop' hinge, which prevents the lid from falling back. The top two compartments of the box also have their original hinges. The box stands raised on its original domed hardwood feet, and is complete with its original working lock, key, and musical movement. Details of the movement are further down in the description. This box has an abundance of stunning micro mosaic inlay, known as 'mosaic tesselated inlay'. It is made up of 1000s of tiny pieces of wood, painstakingly put together to form intricate mosaic designs. The large inlaid panel upon the lid has a beautiful tapestry like appearance and features lovely hearts and flowers. 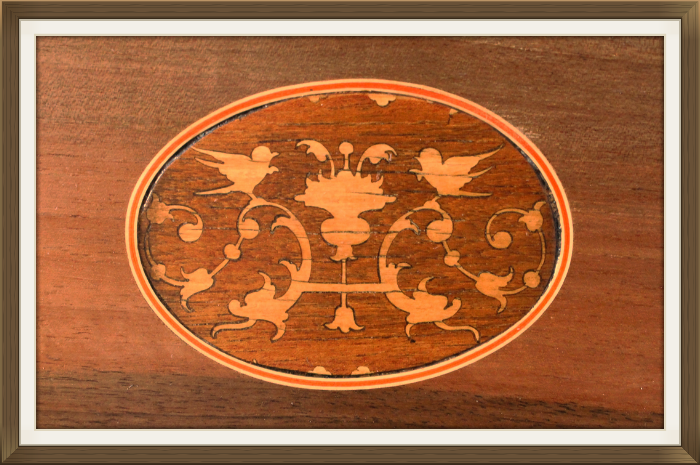 There is a beautiful inlaid border around this, and a further inlaid border around the edges of the lid. 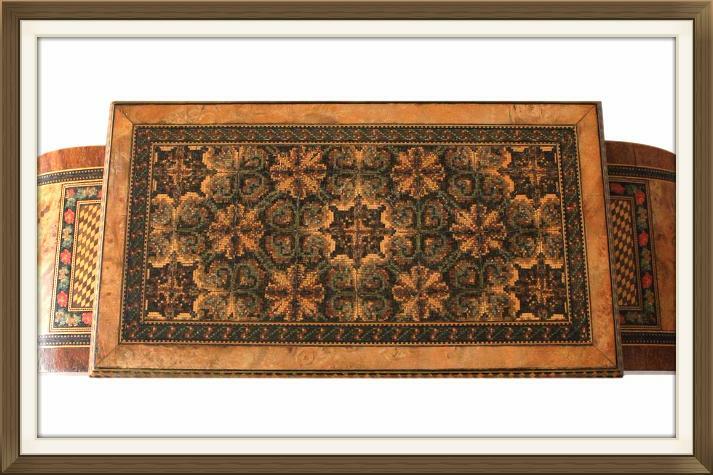 This has a wonderful diamond pattern and inlaid stringing on either side. 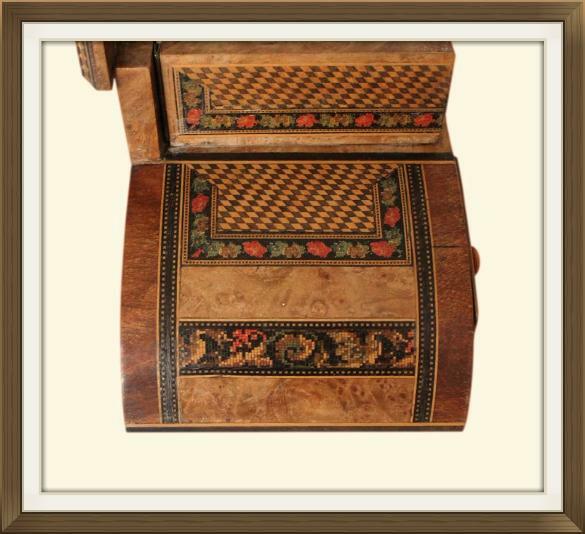 There is further chequered diamond and floral inlay to the body of the box (the front and sides) and the two drawers at the front. There is also beautiful inlaid stringing to the front, sides, and back of the box. The top of the box has two swing opening compartments, and there is a further larger compartment beneath these. The musical movement is nicely cased to the left of the lower compartment, and there is further shallow storage space upon the ledge of the casing. There are also 2 storage drawers which pull out from the front of the box. These have quality stop blocks which prevent the drawers from falling out. As you can see there is a fair amount of storage space within this wonderful large box! All of the compartments have their original plump, padded and quilted satin panels. 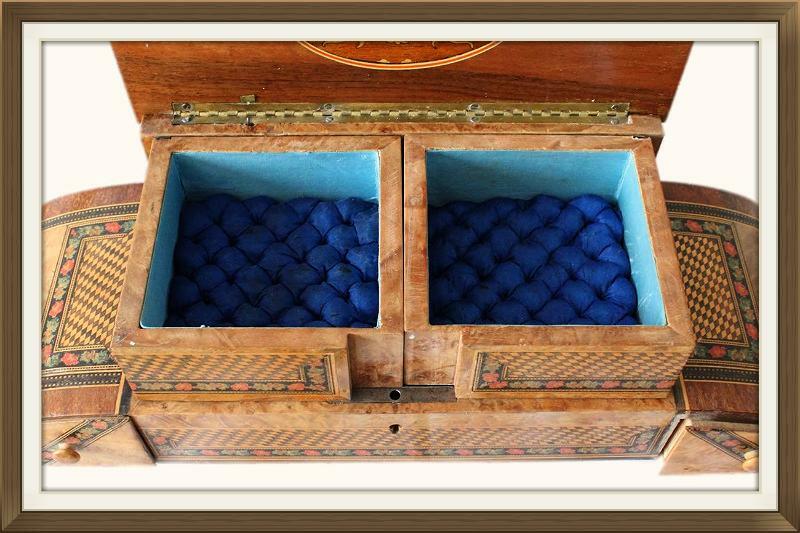 Their inner walls have satin linings, as do the compartments of the drawers. The quilted satin panels in the top swing compartments is a dark blue shade. The rest of the quilted satin panels/satin linings, are a lovely powder blue shade. There is a beautiful oval panel to the inside of the lid. 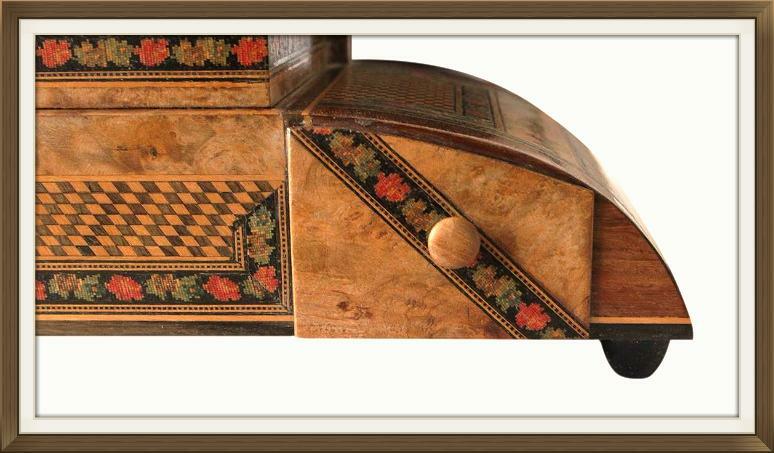 This has very pretty marquetry inlay which features birds and scrolling leafy vines. The panel is surrounded by a lovely oval inlaid border. This panel replaced a broken mirror. It was taken from another Italian Sorrento box, which was made during the Art Deco period. 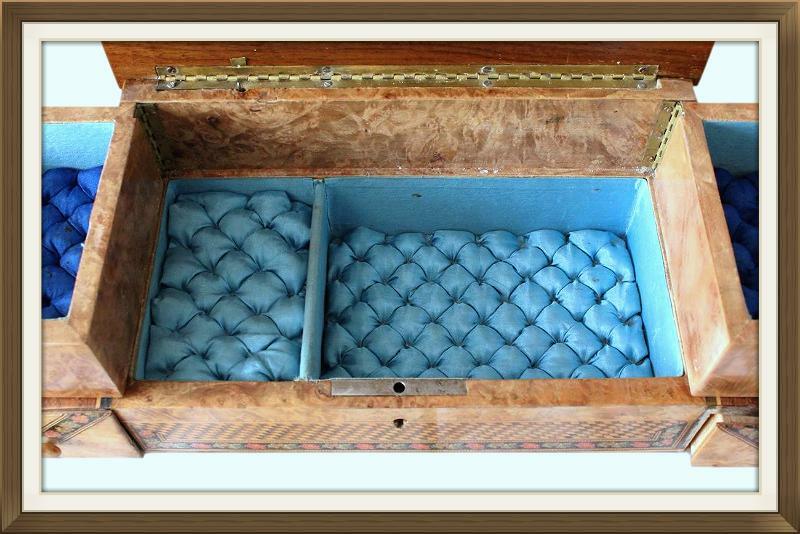 It was shaped and fitted by our wonderful box restorer Jim, and is a beautiful bespoke addition to the box! The musical movement plays a very pretty tune, the title of which we have not been able to decipher. It is operated via a wind up key on the base of the box. 5 short turns of the key are sufficient to wind up the musical movement. This wonderful box is in excellent condition for its 95 plus, years of age. It is structurally sound and free from damage. All of the veneers and Inlays are present and intact. The silk to the interior has picked up some staining over the years. This is as you'd expect from a genuine old box, which has been loved and used for its purpose. Each 9.0cm square with a 3.0cm depth. 14.0 by 9.5cm with a 4.0cm depth. 9.5 by 6.5cm with a 1.0cm depth. Enjoy £10 off Vintage & Antique Jewellery plus free next day delivery on our sister site, The Antique Jewellery Shop. Please see website for details.